We come across some interesting projects in our travels, and this is one of them. 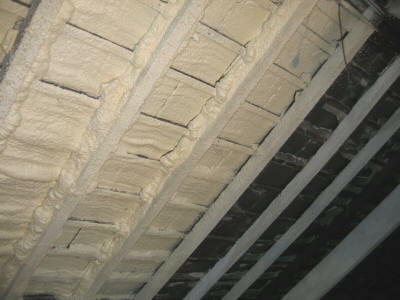 Insulating the Lady Jane. What or who, you might ask is the Lady Jane. Well, she is a rather large old lady… or more specifically, she is an ex fishing trawler (All 90 feet of her!!!). Lady Jane is approximately 40 years old and was launched in Ostend, Belgium and was built to fish in the North Sea. 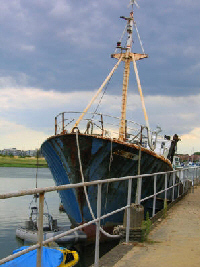 “Lady Jane is a single engine, steel hull trawler. 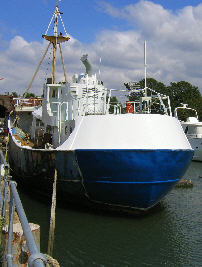 She is entirely welded (as opposed to riveted which is apparently not as strong) and divided by 5 watertight bulkheads into 6 classic trawler compartments which comprise of; steering room, galley with crew quarters, engine room with battery room and wheelhouse, fish hold, forward locker and the net locker. The stern is of the cruiser stern type, rounded to take heavy seas.” enthuses the owner Tim. The Lady Jane was purchased with the intention of converting her to a live-aboard. She is currently moored in Hampshire and is being lovingly restored by Tim. Visit Tim's blog for the latest progress on his pride and joy. Tim has spent the last 2 years working hard on the Lady Jane, whenever he gets a spare moment to do so. 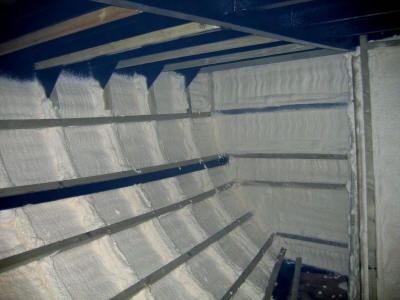 Click on the link to find out more about his adventure and to read about his comments regarding insulation of the accomodation spaces with Handi-foam As you might have guessed, we have supplied the Expanding Foam insulation kits for insulating Tim’s future live-aboard. Tim initially experimented spraying onto bitumen, unfortunately that did not stick very well as bitumen is an oily substance. He then painted Rustroy over the bitumen and sprayed the foam onto the painted surface, which the foam stuck very well to. 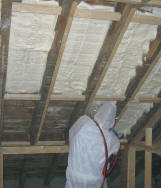 The next stage involved his beloved Hilti-Gun and a good many metres of wooden battens. It is always best to do all your preparation before you start spraying. Make certain you have your wooden battens in place as well as any conduits for electrical wiring; and also get your plumbing sorted out. Whilst these are things that can be done after the fact, it will simply create more work for you. 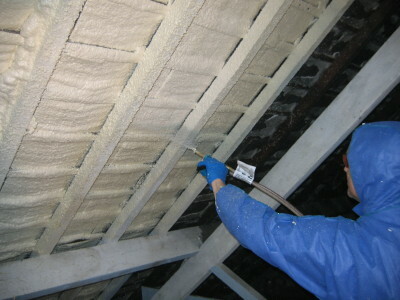 Tim then sprayed an inch of foam between the wooden battens and was quite surprised by how quickly the foam was applied and was relieved at the large area the foam covered. 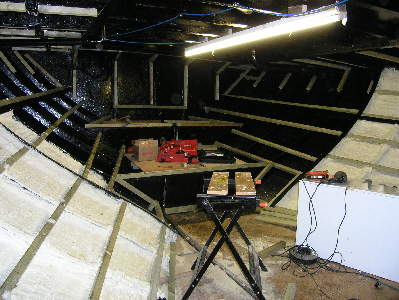 As you can well imagine, renovating a boat the size of the Lady Jane is no small expense.